To remain a leader, a company must out-perform the world’s smartest executives at billion-user platforms. But a new disruption could produce a flip of today’s pyramid to people-first. That would help everyone advance, and add a people-first ecosystem that makes everyone a winner, with many people-first companies at the top. Digital war is starting because owning a billion-user platform is now possible. These platform companies — Google, Facebook, Microsoft, Apple and Amazon — are racing to capture tomorrow’s digital infrastructure, lead the Digital Economy for decades, and concentrate worldwide wealth and power in their corporate-first pyramid — while consuming the markets and revenues from other leading companies. In the vortex of their global reconfiguration, how could other leading companies disrupt that future? 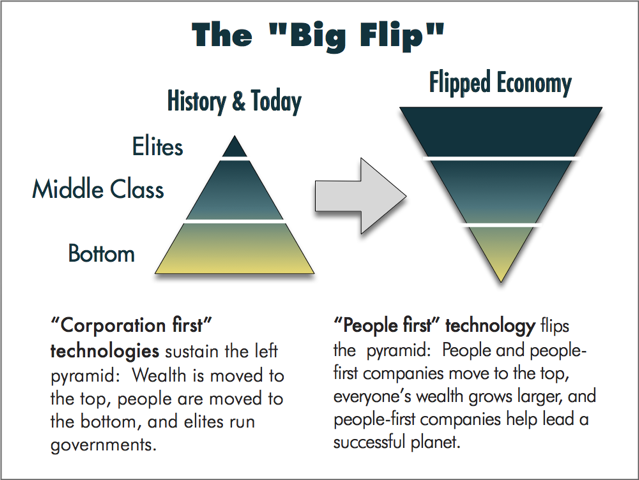 One strategy might be people-first technology that could use a “big flip” to create a people-first pyramid, and build a people-first Digital Economy. The need for disruption is obvious. The billion-user platforms use exponential growth to power their platforms, add relationships and increase revenue. Their new engines include AI, robotics, voice interfaces, chat bots, surveillance tracking, personal manipulation and more. Their goal is to force many companies to share their revenues when they use their platforms to make sales. To disrupt that, new corporate strategy must set a goal to build a platform that helps deliver universal success and prosperity through continuous connections with large numbers of people and companies. The rewards for the new leaders are that they lead a successful world, and own one of its essential platforms. Think again: what is the world? This new strategic goal — universal success and prosperity — comes from our fast-arriving era of adding powerful new technologies and spreading them worldwide at the speed of light. The new network opportunity is to improve user abilities and resources during every digital step, every minute, everywhere. One route to this goal was illustrated by the recent Paris Innovation Review article, "A new R&D paradigm: Crafting strategy at designing patents." A core process is strategic patent design. That defines the business objective, assesses that opportunity's IP potential, then invents and patents the specific technologies needed to achieve that new business future and protect it with IP. Patented technology is proactively planned, created and protected to produce a successful business. Today, conditions are ripe for this kind of strategically planned global redirection. On the tech side, it’s clear that dynamically blended screens, “next best step” guidance, connected consumption and always-on supply chains are arriving. On the motivation side, many leading companies face digital decline, and perhaps even death. These companies could harness a new growth roadmap to lead the coming Digital Earth. Instead of dying quietly, major companies need to disrupt the leaders while they can, and compete by building a continuously connected platform that delivers universal success and prosperity to both people and companies. For the first time in history, because all people and companies can rise to greatness, new companies can lead and win. 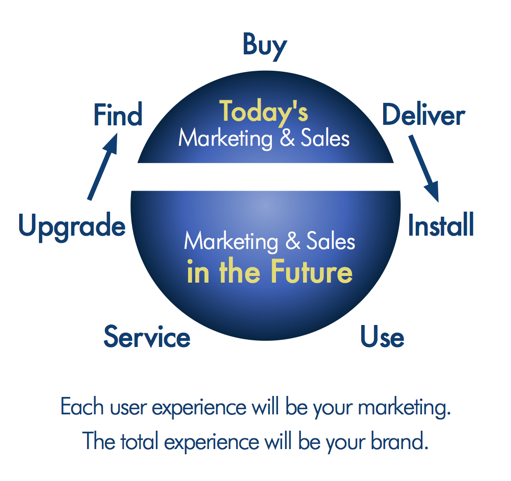 Today’s “Age of the Customer” strategies will soon be obsolete. It’s already normal that customers know more about your products, prices and reputation than you do. They buy what they want instantly for delivery anywhere, and switch without hesitation from you to one of your competitors. Unfortunately, the biggest innovation of a networked world is missing. We are wirelessly surrounded by the world’s best knowledge, tools and commercial choices. But these are disconnected from what we do digitally. Over a billion people may have mobile phones, but humanity’s combined abilities are missing from what they do at each step. In tomorrow’s Digital Economy, user experiences will be connected and two-way. That will require a new category of always-on relationships to win, retain and serve every customer, every minute. Always-on relationships will include four kinds of automation in each user step: Active Knowledge, Active Resources, Active Commerce and Dynamic Knowledge. Active Knowledge learns what the user does and uses that as a trigger to retrieve the “next best step” and “short path to the goal” for immediate delivery when wanted. With adequate bandwidth, that can be delivered instantly for use at any time. Active Resources is a service attached to each step’s Active Knowledge. This adds switching the user to the best available guided tool to help the user succeed even faster and better in reaching their goal. Active Commerce is an embedded, invisible sales channel that can immediately switch the user to the best available product or service for reaching their goal. Dynamic Knowledge is when steps can be done for you. Then, to reach your goal, just choose it and it’s done. No manual steps required. An Active Knowledge network is behavioral, self-learning and user-guiding. It knows each user and the user’s device, application, task and step. It learns from large numbers of users the short paths they take to reach goals, so it knows the “next best step” during each step. As users receive and use Active Knowledge, the results constantly optimize the “next best steps” and “short paths” to user goals, which continuously update to help everyone quickly advance. The result is clear customer journeys for using each product or service. AI, big data and analytics produce these, and each step becomes a trigger for retrieving them and making it normal for everyone to benefit immediately from humanity’s combined knowledge. You could use an online service to manage your finances and immediately know the world’s most successful strategies for maximizing your wealth. You could use your mobile phone to manage the IoT devices in your partly automated home, and apply the best ways to lower your electric bill, cut carbon pollution and minimize global warming. Or you could be an operations manager using a workstation to control an electricity generating wind farm, and apply the best guidance as soon as you receive an alert about an unforeseen problem. It doesn’t matter whether each user is in Manhattan, Mumbai or a Maasai village along the Great Rift Valley in Africa. Everyone can receive the world’s best options as an embedded channel inside of everything they do online. Life will constantly improve for everyone at once when it is normal for everyone to succeed immediately because humanity’s best guidance is always delivered. Within a decade, competitive pressures will drive every company to make products that are interactive, satisfying and successful. Many consumers will want to buy connected products that help them succeed at the best levels. When a product does not deliver user success immediately, it may sell in low volumes, but it won’t lead its category or industry. The companies that deliver this best will gain a new way to capture their markets and industries. They can grow their platform to help other companies deliver interactive success, and could scale that to help lead the economy. Think of your time and consumption as a pie chart. The fastest growing slice is your digitally connected activities or entertainment. In 1980 “digital connections” didn’t exist because the world was 100% physical. By today digital includes a large part of your daily activities. In a decade the physical world will be only a slice while “digitally connected” will dominate. This is a historic shift. Humanity has always lived disconnected and local lives. We are migrating to a Digital Earth where everyone will be in one digital room together, with personal deliveries of humanity’s combined knowledge, digital tools and resources to fit each step in our daily activities. In its positive benefits, “digital” grows rapidly because it works for each person. It brings you what you want in a growing range of ways that include communications, social media, work collaboration, applications, information, services, entertainment and more. In its negative uses, today’s corporate surveillance feed big data, analytics and AI’s that profile, track and target you for engagement, conversion and retention. These systems are designed and tested so that they attract and keep your attention, and produce sales that increase revenues and accelerate growth. This will be transformed over time by market forces and increasing user controls. Digital grows faster in ways that work for people and deliver what they want. In the future, users will enjoy touchpoints that produce ever more satisfying experiences, with products and services that are delivered when and where they want them. A name for this is Connected Consumption, which looks similar to today at the surface, but will transform today’s technology from a negative that attempts to manipulate people, into visible choices that people make to benefit themselves in the ways they want. Align users with their always-on vendors, the companies they trust with their personal needs so they can deliver Connected Consumption. When their needs are not met, users have a digital kill switch to terminate and switch to different always-on vendors. Boundaries make screen displays the world’s most valuable real estate — with users in control. Users decide what their screens display. If they want to live in a world of healthy food and renewable energy, those are what they see. The ads, content and vendors users believe are wrong disappear. Connected Consumption delivers what users need, where and when wanted, from their always-on vendors. Supply chains will be managed for accuracy and efficiency, lowering costs and prices, while raising quality. Customer Journeys to Quality Lives will dominate marketing, to know always-on users’ needs and meet them as well as possible. Marketing Automation uses personal interactions during consumption and at touchpoints to fit deliveries to each person’s needs. These increase user control over Boundaries and Connected Consumption, so vendors deliver Journeys to Quality Living that increase customer loyalty. 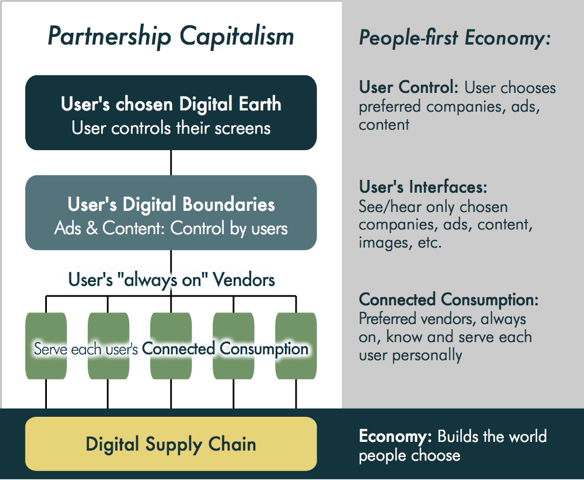 Partnership Capitalism delivers the worlds users want, and makes people-first companies the economic leaders. The size of the economy is increased by making personal success the norm. The productivity of the economy is transformed by Connected Consumption and efficient supply chains. For the first time in history, people can choose the world they want, and trusted companies can deliver it. These always-on companies gain reduced marketing, minimized advertising and decreased risk by serving Connected Consumption within Digital Boundaries. The size and shape of the economy are transformed by universal personal success and Connected Consumption. Why would threatened companies do this? Billions of advertising dollars, and trillions of consumption dollars are at stake. Major industries and companies are being slaughtered by digital platforms that take those advertising and consumption dollars for themselves. Newsrooms are shrinking, stores are closing and the middle class is failing. Instead, this could be a Digital Earth where today’s billion-user platforms are important, but both people and people-first companies also grow strong and powerful. Users have always controlled what they see, but until now screens have been dynamically constructed for them. Ads that fit each user are retrieved in real-time to display a unique combination on each person’s screens. Augmented Reality recognizes an object, retrieves information about it and dynamically blends that in. Virtual Reality draws a new screen every 30th of a second as people and objects pass in front of each other, change perspective, and move in every direction. A powerful advance will be user control of their own screens, when the user’s Boundary instructions decide what is and is not displayed. New Boundaries services might be able to limit today’s advertising platforms role and power. The ad platforms will transmit ads and content, but might not know if the user displayed them on their screens. Consumers could see the quality lives they choose by displaying the world they believe is right for them. They won’t need search, shopping or an ecommerce store. Instead of searching, their Boundaries display their choices of products, ads and content. Connected Consumption brings them what they need at the times and places needed. Just as important, each step embeds an invisible, private channel of the world’s best knowledge, tools and commercial choices for what they are doing. Everyone can succeed immediately, or switch to use the best digital tools or products immediately, and be as good as the best in the world. These new services expand our generation’s exponential growth opportunities. Living the dream could be normal, producing it with the best knowledge known. User-controlled Boundary and Connected Consumption services might be added by today’s dominant platforms. Or they could be built and run by ad-tech and ecommerce companies — and managed and sold by new companies that need to compete with today’s dominant platforms. Major media companies (Disney, NY Times, Fox) may want to claim the role of content and advertising gatekeepers for consumers worldwide. Major Supply Chain companies (Oracle, SAP) may want to sell these as platform services to the global Fortune 2000. Top consulting firms (Deloitte, PwC, Accenture) may want to help hundreds of leading companies build their own private services, or integrate their systems into Connected Consumption platforms. Nonprofits could help manage Boundaries and Connected Consumption that promote their goals and fundraising in causes like environment (Nature Conservancy, World Wildlife Fund), hunger (Feeding America, Food for the Poor), health (Doctors Without Borders, Red Cross), medical (St. Jude’s, Dana-Farber), poverty (Salvation Army, Save the Children), or others. Or these Boundary and Connected Consumption services can managed by niche companies in businesses like weight loss, exercise gyms, or health care to help their customers see only appropriate ads and Connected Consumption in their part of their lives. Boundaries and Connected Consumption give users control of the world in which they live. In Partnership Capitalism, people-first companies really must please consumers. This turns today’s pyramid into a relic. Our “few-elites-at-the-top-who-run-everything” world could be obsolete. Tomorrow’s "winners-eat-everything world" will flip everyone and many people-first companies to the top. The world will be what we choose, with humanity’s best knowledge-tools-and-choices embedded in what we do, with always-on companies serving people immediately. Digital changes everything. Is it finally time to flower into a planet that delivers universal success and prosperity, and makes personal greatness its new norm — without attacking those at the top, and without a revolution.